Since 1975, the Young Conservatives of Texas have provided reviews of the voting records of legislators to the citizens of Texas as a public service. 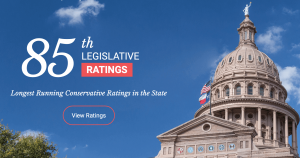 YCT is proud to release the 19th installment of our Legislative Ratings—the longest running and most prestigious legislative ratings in Texas. Legislators are scored on a scale from 0 to 100, with points being awarded for each conservative vote. The 82nd Legislative Ratings also include a comparison of scores between House committee chairs from the 81st and 82nd Sessions, a feature added to the ratings to assist voters in comparing the change in House leadership. 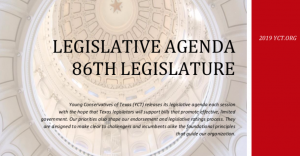 Legislative Publications — Each session YCT publishes a legislative agenda which outlines our positions on the issues we believe could arise during the legislative session. The agenda starts with our positions on higher education, and goes on to address K-12 education, school finance, and fiscal issues, amongst others. 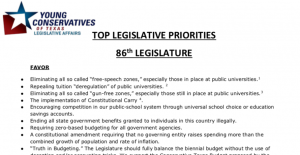 In addition, for the 82nd Texas Legislature, we have provided a list of our legislative priorities; ten policies which we would like to see passed this session and five policies which could arise to which we are bitterly opposed. Following the agenda and voting with YCT’s position is the surest way to score well on YCT’s legislative ratings. In addition, YCT will publish policy papers and written testimony on issues related to our legislative agenda. Papers from previous sessions regarding relevant issues are posted. Check back during the session as more papers and written testimony are added to the site. Historical Ratings – These spreadsheets provide the session and career scores for every State Representative and State Senator since 1975. The compilations were first assembled as internal files for purposes of computing members’ career scores and are being released to the public for the first time. We hope that fellow followers of the Texas legislature will find them as interesting as we do and enjoy the historical look at how scores have changed over time and how the members of yesteryear stack-up to today’s Representatives and Senators.